Please refer to our stock # LG36 when inquiring. Bead Chain fixtures were the standard ceiling fixture of the American home from the 1920’s through the 1940’s. The decorative glass shade hung from 3 bead chains, and could be adjusted up or down depending on the size of the room and height of the ceiling. The graceful Art Deco design of these fixtures makes them the perfect fit in today's homes. 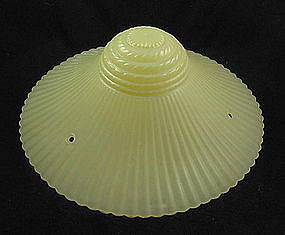 This vintage 11 1/2 inch glass shade was made by MacBeth Evans and compliments their Petalware pattern. The shade is done in crystal with a yellow ceramic finish on the outside. Price includes both the shade and the mounting hardware in your choice of brushed & lacquered brass or brushed steel. (The steel can be left natural or painted to match your decor.) The bead chains are 6" long so the entire fixture has an adjustable drop from 10 to 16 inches. Make sure to specify which mounting hardware you'd like. Please note: while the glass shade dates to the 1920's - 40's, the mounting hardware is new.